Recent SRF German public broadcasting commentary on climate change has reached a new low in quality and new high in activism, two respected German scientists say. November 29, 2017, was once again a climate alarm propaganda day in the German public television and radio stations of SRF (Süddeutsche Rundfunk). But it was even more shocking to see the primitive level of argumentation used there to fan fear among the public. For example this video clip here, designed to refute climate skeptics, unfortunately in fact represents an intellectually subterannean SRF alarmism theater, which uses arguments as a “hammer against skeptics”. Bingo. Yet no one is challenging that it has been getting warmer since the end of the Little Ice Age beginning in 1850. But why was nothing said about how the melting glaciers of today are uncovering tree trunks from even warmer periods of the Holocene and that as a result the glaciers back then were at much higher elevations and smaller in size than they are today? OMG! – just recently – and was that meant for real? However the diagram ends at the peak of the last El Nino of 2016. The decrease in temperature since then and the term El Nino are not mentioned at all in the explanation. …but they are really not doing okay because of the supposedly melting ice. The chart shown interestingly looks only at a few areas where the numbers are expected to fall, and ignores the fact that the populations have developed normally or well over the recent years, despite the reduced ice coverage. The manipulative character of the agitation is demonstrated by the fact that the most important arguments held by climate skeptics find no mention whatsoever, for example the fluctuating long-term solar activity in combination with the amplification mechansim as to Svensmark, the oscillating ocean currents on decadal scales , the obviously hyped CO2 climate sensitivity in the IPCC models, the refuted water vapor feedback and – last but not least – the inability by the CO2 alarmists to successfully model the strong natural variations of the Holocene climate. two respected German scientists say. Yes, absolutely sure. I’ve met both them and they are very far from being “denialists”. Also their contributions have been invaluable in sparking a very much needed debate and discussion on the issue…something that climate alarmists are constantly fearing and seeking to shut down. Do you need examples from their blog? A little skepticism towards what they write/say is needed here … aren’t you calling yourself a skeptic? Funny. You call them denialists and then turn around and champion people that deny the other warmer periods of climate. The only “denialists” in the climate debate can’t see beyond their breath. Sebastian, when are you going to actually address what these two scientists say,why not focus on the 5 examples listed here? Meanwhile no counterpoint to what they talk about. Where is YOUR skepticism of their list of 5 examples? Too hard for you do this,Sebastian? All you seem to do in this thread is talk whether they are deserving of respect,call then denialists and call what they post nonsense. Yet ZERO counter arguments to their presentation comes from you in this thread……………., snicker. Ah, the counter argument theme … again. Bingo. Yet no one is challenging that it has been getting warmer since the end of the Little Ice Age beginning in 1850. Really? They guy in the short clip says that some climate skeptics say this and brings up a graph showing glaciers are shrinking (time mark 0:47). That’s all. What exactly has a warmer past to do with a changing climate today? The correct translation would have been “not really” and not “just recently”. The short clip explains that President Trump has said this (which is true) and shows that this is just another stupid claim of his. The clip doesn’t just show a diagram which ends on a El Nino high. It also mentions many other indicators that climate change (or rather the warming) hasn’t paused. All of which are ignored by the snappy comment of Lüning/Vahrenholt. The clip says that populations are stable in many regions, hell even the WWF says that (from where the shown chart is most likely taken from). The clip also says that claiming everything is alright with the polar bears is a false claim because they are finding fewer seals to eat and young polar bear death rate is increasing. That’s an incorrect translation of an incorrect statement in the original blog post of those “respected scientists”. The clip guy actually says that in serious studies usually above 90% of all climate scientists are believing climate change (or rather the claim opposed by http://www.petitionproject.org/, where the percentages mentioned are coming from) is real. So in a way the 97% figure was indirectly mentioned. Oh come on, it is a short clip from a late night science TV format. What do you expect? That they spent all their time discussing the ridiculous claims of “skeptics”? It’s weird enough that they felt the need to produce such a clip at all, engaging in that pigeon chess game which is a colossal waste of time. It’s also funny to write about manipulative behavior, when that is all that Lüning and Vahrenholt are doing. Every single blog entry and their whole book is manipulative. So, sunsettommy … any “counter arguments” from you? Why do you think it is that your side decided that “We must get rid of the Medieval Warm Period”? What would be the motivation for Michael Mann to make the MWP disappear? So of all the points you pick that one and go the conspiracy theory distraction route (again). And you wonder why you aren’t taken serious as “skeptics”? Um, it’s not a conspiracy to ask why your side needed to get rid of the MWP. What do you think the reason is that there was no MWP in Mann’s 1998/1999 graph? And SebastianH is a known alarmist, believer in Santa Claus, the Easter Bunny and Tooth Fairy. John says, no feed the troll please! He mix up healthy scepticism with denial. Please define what a denialist scientist is, SebastianH. What is the truth that is being denied? And please identify the “nonsense” in these two scientific papers. Do you think that dismissing scientists’ work as “nonsense” is an effective “rebuttal”? The Medieval Climate Anomaly (MCA) is a well-recognized climate perturbation in many parts of the world, with a core period of 1000-1200 AD. Here we present a palaeotemperature synthesis for the MCA in Africa and Arabia, based on 44 published localities. … Offshore cores from outside upwelling systems mostly show warm MCA conditions. The most likely key drivers of the observed medieval climate change are solar forcing and ocean cycles. Conspicuous cold spikes during the earliest and latest MCA may help to discriminate between solar (Oort Minimum) and ocean cycle (Atlantic Multidecadal Oscillation, AMO) influence. Millennial-scale climate variability is a globally well-established Holocene phenomenon described for all oceans and continents. Cycles are known from upper, middle, and lower latitudes, encompassing all climate zones from the Arctic to the tropics. The amplitude of the observed temperature fluctuations is often more than 1°C and thus has a similar or even greater range than the warming that has occurred since the Little Ice Age. Furthermore, many of these Holocene, natural climate fluctuations show the same level of abruptness as the 20th-century warming. Have you read reviews of their book “Die Kalte Sonne”? That book is the definition of misleading readers and betting on nobody fact checking them. It’s full of straw man arguments and wrong depictions of climate science papers. Resorting to these kinds of tricks is one form of denialism. The nonsense is that you (and they) imply that the cause for similar events could be identical. So if the temperature has changed in the past from other causes it can’t be a different cause this time. Or in other words, cars regularly break from 50 mph down to 0 mph by actually applying the brakes, it surely was the breaking of the driver that stopped the car that is wrapped around a tree over there. That argument of yours ist a non-argument. Regarding other nonsense they wrote. There is no evidence that supports anything they write about Svensmark, nobody can extrapolate ocean oscillations as far as they seem able to be, etc. They are climate alarmists in the opposite way, propagating the coming “ice age”. They are denialists and not “denialist scientists”. So it is your position that once a scientist demonstrates that she or he does not agree with the position that humans control ocean temperatures by emitting more or less CO2, she or he loses the characterization as a scientist…and becomes a denialist instead? Do you find that the word “denialist” is superior to calling scientists “deniers”, SebastianH? It’s full of straw man arguments and wrong depictions of climate science papers. I don’t read German, but considering your track record of misrepresentation and dishonesty, I won’t be taking your word for it when it comes to a review of their book. The nonsense is that you (and they) imply that the cause for similar events could be identical. So if the temperature has changed in the past from other causes it can’t be a different cause this time. This is such a terribly weak argument. So, for millions of years, including this interglacial, (0-1000 m) ocean temperatures used to fluctuate up and down on centennial time scales (by 1.0 degrees C per century) due to natural factors unrelated to CO2. Then, beginning sometime in the 1800s or 1900s, those natural influences that caused 1 C/100 years fluctuations in ocean temperatures…just…stopped. Humans took over, especially after the year 1950. Since then, the 0-2000 m layer has warmed up by a whopping 0.09 C, and effectively none of that dramatic and dangerous change is related to natural factors. Instead, close to 100% (if not more than 100%) of that change has been caused by humans. This isn’t nonsense…but those who question this perspective are peddling nonsense. Because you said so. Is that one of your famous interpretations of what other people write again? Once someone demonstrates that he/she is ignoring reality and begins constructing his/her own version of a reality while simultanously using tricky language to deliberately mislead other … then this person becomes a part of the denialist crowd, no matter the profession or if they call themselves “skeptic”. Then, beginning sometime in the 1800s or 1900s, those natural influences that caused 1 C/100 years fluctuations in ocean temperatures…just…stopped. I won’t get into a a back and forth thing with you again. You are making up your own reality too. And if you believe that’s what “alarmists” are saying, then ok … you know what I am going to say next: unicorns, wonderland, etc. SebastianH, in addition to calling them both stupid, you wrote that Dr. Luning and Dr. Vahrenholt are not denialist scientists, they’re denialists. It would appear that this means you no longer consider them scientists once they write something that puts them into the denialist category, whatever that means. SebastianH, the viewpoint that humans control how warm or cool the oceans get by emitting more or less CO2 is not “reality”. It is a hypothetical version of what you and your ilk think “reality” is. The viewpoint that the Sun controls how warm or cool the oceans get is also not “reality”. It’s a hypothesis advanced by many scientists that is subject to heavy ongoing debate. The science is not settled. We have a long ways to go to figure out how the climate system works. Instead of shutting down debate, we welcome it. Your side shuts down debate by calling people names (like “stupid” and “denialist”). Not particularly persuasive, though. I don’t think the English language allows for that conclusion, but if you do that explains a lot. You can be a denialist and it doesn’t affect your profession at all … nevertheless, you are still a denialist. Just like you can be a celebrity scientist. Talking about the celebrity status of that person doesn’t make them “non-scientists”. Do you get my point and notice where your interpretation skills have once again let you astray? SebastianH, the viewpoint that humans control how warm or cool the oceans get by emitting more or less CO2 is not “reality”. That’s also not quite how it works. I am not sure you really understand what you are arguing against. The Sun is the source of a nearly all the energy that determines the near surface heat content of our planet. That is the reality. Since we are talking in terms of “sides” (Vahrenholt uses the same “trick”, painting everything black and white), what exactly is your side doing then? Spreading doubt while betting on no one actually fact checking your claims and “possible alternative explanations”? Debating with denialists is like playing chess with a pigeon. If you want to be seen as a skeptic, don’t ignore physics. Otherwise, people will assume you don’t care and “will knock over the pieces, crap on the board and fly back to your flock to claim victory”. You wrote that Dr. Luning and Dr. Vahrenholt are not denialist scientists, but denialists. You also called them both “stupid”. So do you consider them scientists or not? Since you think they’re stupid, I would assume you don’t think they’re scientists. Or is it possible that you just consider them stupid scientists? If so, does name-calling help your case in your efforts to appear substantive? Why would there be a problem with spreading doubt, especially since there is so much admitted uncertainty in the climate debate? Why should we just take Michael Mann’s word for it that humans worsen hurricanes, for example, or that modern temperatures are warmer now than they’ve been in millennia? Why should we just believe James Hansen that sea levels will rise by 10 feet by 2065 because Antarctica and Greenland ice sheets will melt catastrophically? Why should we just accept that 110% of global warming has been caused by humans since 1950, as Gavin Schmidt insists? Why not examine these claims and see how they match up against the evidence? Why call people “denialists” who go about questioning the conclusions of people like Mann and Hansen and Schmidt? Because that’s what’s going on here. Why do you have such a problem with those who doubt that Mann and Hansen and Schmidt have got it all figured out such that you must call people names? You wrote that Dr. Luning and Dr. Vahrenholt are not denialist scientists, but denialists. You introduced the term “denialist scientists”, I corrected you by repeating that they are denialists and not denialist scientists. You also called them both “stupid”. No, I called them stupid, if they are not misleading their audience on purpose, but really believe what they say/write. You are the pedantic that insists on the exact way something has been written/said and yet you make these kinds of things up all the time. Why? Since you think they’re stupid, I would assume you don’t think they’re scientists. Or is it possible that you just consider them stupid scientists? If so, does name-calling help your case in your efforts to appear substantive? Nothing I wrote allows for that conclusion. That is entirely your biased interpretation. I suppose the same poor interpretation skills are applied when you read a paper. You are also trying to steer the conversion away from the topic (nearly every time) and now we are debating whether or not I think they are scientists or not instead of the nonsense they wrote in their book and on their blog. Good job (again). 1) gravity and pressure are causing the surface temperatures to be as high as they are. And many more such things. You are either intentionally misleading your audience with these statements or you really believe this, with is equally as bad. Why call people “denialists” who go about questioning the conclusions of people like Mann and Hansen and Schmidt? Why ignore everything I reply to your ridiculous claim that I am doing that? I have a problem with people ignoring reality and who claim stupid things. I think debating their theories is equally as satisfying as playing chess against a pigeon. I corrected you by repeating that they are denialists and not denialist scientists. The comedy act continues. So I wrote that you wrote that they are denialists, but not denialist scientists. You say that you corrected me by pointing out that you didn’t write they aren’t denialist scientists, but denialists; you wrote that they are denialists, but not denialist scientists. So the key difference between what you wrote and the “corrected” version of what you wrote is the sequence: the not-denialist-scientists designation must come second, and the yes-they-are-denialists must come first. They are denialists, but not denialist scientists is correct. They are not denialist scientists, but denialists is an incorrect interpretation of what you wrote. Are Dr. Luning and Dr. Vahrenholt scientists, SebastianH? Yes or no? If yes, do you agree that, as denialists who also happen to be scientists, that makes them denialist scientists? Or do they cease to be considered scientists once you have clarified that they are denialists? No, I called them stupid, if they are not misleading their audience on purpose, but really believe what they say/write. This is surreal. SebastianH, I have personally communicated with Dr. Luning via e-mail multiple times. (He’s English-fluent.) He really does believe what he writes (of course). That you would suggest that he is either intentionally trying to mislead his audience — a revolting accusation — or he is stupid for believing what he publishes scientific papers about…is despicable. As is your behavior on this comment thread. Since you think they’re stupid, I would assume you don’t think they’re scientists. Nothing I wrote allows for that conclusion. That is entirely your biased interpretation. Hmmm. So do you believe Dr. Luning and Dr. Vahrenholt are scientists? Yes or no? Since you’ve claimed they are both stupid if they believe what they write about (and I am quite confident that they do, knowing what I do about Dr. Luning), do you think it is common for people who are stupid to earn their Ph.D? Do you think it’s effective and persuasive to call scientists (or non-scientists) stupid? What does the first comment on this article say? Who wrote it? You are the one who continuing it. Why has this thread become about whether or not those two are scientists or not? – i defined denialist many times for you and have no inclination to define “denialist scientist” for you. Can we now go back to discussing the nonsense that those two are publishing? So Drs. Luning and Vahrenholt are denialists and they are scientists, but they are NOT denialist scientists. You’ve also called both Dr. Luning and Vahrenholt stupid…because they actually do believe what they write about. But even though you have called them stupid and denialists and scientists, it is a severe misrepresentation to say that you have called them stupid scientists, or stupid denialist scientists. They’re stupid. They’re denialists. They’re scientists. Does it feel good to insult those who you disagree with? Does it feel good to distract from the topic by trapping others into replying to your weird interpretations of what people might have said? So by calling you out for calling these German scientists “stupid” and “denialists”, I am “trapping” you, and it is my fault that the topic at hand has gone unaddressed. Could you explain how this comment addressed the topic at hand, or how this comment did not personally attack the scientists named above? Are you planning to continue defending calling these scientists “stupid”? Does calling these scientists “stupid” address the topic at hand? Yes, SebastianH denies that Dr. Sebastian Lüning and Prof. Fritz Vahrenholt, both with great academic credentials and multiple publications behind them are “scientists”. Kind of says it all. Amazing straw man argument construction effort. Stop making up things people never said or wrote. Kind of a “I make my own reality” person yourself, are you? No straw, just your own words. If they don’t agree with your view they are not “scientists” anymore in your judgement. It’s there for everyone to read and it reveals all one needs to know about your lack of objectivity. Person A calls a person C a celebrity. That person happens to be a scientist and person B says why A is calling C a “celebrity scientist”. A replies that he wrote just celebrity and not celebrity scientist. Question: does A mean by this that C is not a scientist? If you really took that away from this short exchange, then it explains a lot. You have quoted accurately, and given the main thrust of seb’s criticism this far you are evidently correct. And that’s the essence of “your side”. Misrepresenting and misinterpretation. I skeptically look at the objective observable evidence. I look at models if they back-up the observations. The theories I prefer are mostly my own, and often change when the observed evidence shows that it is required. However from the observed evidence so far, all indications are that YOU are the one with a quite extreme and static views on climate matters. If a paper supports your views but with only modeled outcomes that happens to support your preferred theory but with little or no observed evidence, YOU quite UNSKEPTICALLY usually support it. But then again that is all AGW advocates have — unproven, unfalsifiable theory, backed-up by unverified and unvalidated models. It’s not science it’s a religion! Isaac Newton was among other things a devout Christian, and his religious output probably surpassed the content of his Principia. In his historical research into Christianity, he commented that a relevant quality of all religion was the durability of humanity’s inveterate tendency to superstition and idolatry. The Egyptians, according to the account I read of Newton’s investigations, even had two levels of religion, one highly arcane and spiritual for the educated priestly and upper classes, and one based on animal gods and statues for the commoners. It is interesting today to witness how superstition not only is alive and well amidst modern scientific knowledge but also in the face of established spiritual religions. He was also ruthless in hunting down fakers when working at the Mint. Newton is the world’s most famous Alchemist. It’s a bit like a Wildebeest takes off and they all stampede. People want to feel a part of the group. They panic and run, scared to death that if ‘something is not done about global warming they will all burn to death’. It is a lot easier to live in a warm climate than a cold one. To all the warmists I say “WAKE THE HELL UP” things have never been better! Poor Sebastian who spends his time here moaning,while avoiding working up a counter argument. It appears you have nothing. What’s a “denialist”, SebastianH? What climate truth are these “denialist” scientists denying? Why are you repeating this comment here? Sunsettommy has never linked to Lüning/Vahrenholt as far as I know. Reply to your question, see above. If they aren’t in denial and doing this on purpose, but really believe their nonsense, then they are just incredibly stupid. But reading parts of their book and their blog posts points to them doing this on purpose. I mean who would claim that he himself submitted hundreds of corrections to an IPCC report and use the fact that they weren’t disputed as a sign that the report is a bad one? Almost all his remarks (one can look them up) are cosmetical and were actually considered in the final version. A perfectly normal process that this guy is using to trick his audience into thinking the IPCC report is bad science. Nope, he is misleading his audience on purpose and therefore is in denial about reality. Why are you repeating this comment here? Because it wasn’t responded to the first time. If [Dr. Luning and Dr. Vahrenholt] aren’t in denial and doing this on purpose, but really believe their nonsense, then they are just incredibly stupid. When you call scientists who question your viewpoints “stupid”, you just lost the argument. 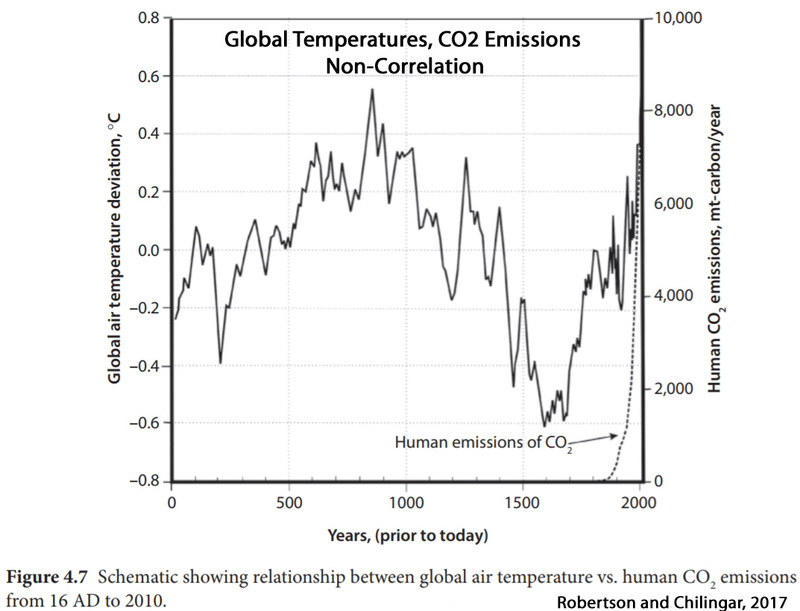 Reality, per your version, is that humans control the temperature of the world ocean by emitting more CO2 or less CO2. Less CO2 emissions from humans, we cool the oceans. More CO2 emissions from humans, we warm the oceans, melt glaciers and ice sheets, and raise sea levels. This version of “reality” has not been established scientifically. One cannot “deny” a hypothetical concept. Then you have nothing Sebastian,since you waste your time complaining,why are you coming here? Since then all you do is call us deniers and complain about me. You like calling people deniers,then challenged on it, you back away never answer the question on what is being denied. Why can’t you answer Kenneth’s question about you calling us deniers? It was YOU who opened the door about it in the first place. Meanwhile you forget the many times I use the IPCC,Satellite data,NOAA sources,and more like it,which are not “obscure” sources. People here have tried to debate you honestly,but you come back calling us deniers,mock comments and ignore solid sources that doesn’t agree with you. Attacking a couple scientists with name calling,disrespect is a dead on arrival argument tactic,which is why people reading your dumb comments wonder if you don’t care. The problem is actually within YOU. There is no argument here. It’s pigeon chess all over … also, they aren’T questioning my viewpoints. They are making up stuff and package it in a way so weaker mind fall for it. They do this deliberately or if they don’t, they really are “stupid”. Both causes for their behaviour are equally possible. This version of “reality” has not been established scientifically. Indeed it hasn’t. Why? Because it is not what climate scientists are saying. You have yet to show that you understood how the CO2 mechanism (or GHGs in general) works or in your case is supposed to be working. It’s not hypothetical at all, but true enough, you can not deny a hypothetical. So why is their claim of knowing the future by extrapolating data that can’t predict the future any good then? That’s not even hypothetical, that’s nonsense. Also, they continued insistence on Svensmarks weird theory? There is no argument here. So if there’s no argument about the Sun playing a fundamental role in modern and past climate change, then why are you here arguing that modern warmth is nearly 100% caused by human CO2 emissions, whereas scientists like Drs. Luning and Vahrenholt (whom you claim are not scientists, but denialists) argue that the Sun plays a dominant role? Has this now been sufficiently settled so that you can call those who question your position that humans control ocean temperatures by emitting more or less CO2 denialists and non-scientists? Indeed it hasn’t. Why? Because it is not what climate scientists are saying. So climate scientists like Michael Mann and James Hansen are NOT saying that humans warm up the oceans with their CO2 emissions, and therefore we need to reduce our CO2 emissions so as to prevent more warming from occurring? Can you point out where these climate scientists have NOT been saying this? So why is their claim of knowing the future by extrapolating data that can’t predict the future any good then? So Drs. Luning and Vahrenholt have claimed to know the future? Or is it more accurate to say that they have identified patterns of historical solar and ocean cycles that, if this pattern continues, suggest we could be headed for a drop in temperature in the coming decades? For some reason I think it’s likely that my nuanced wording is more likely to be the case. Your wording — that these scientists claim to know the future — is another of your dishonest renderings in an attempt to smear people with whom you disagree. Actually, I come here to waste time, literally. I am calling the “respected scientists” from the blog post deniers/denialists and Kenneth is asking about them too. What are you reading into these comments that isn’t there? Have you? I keep confusing you with yonason then. You are the “no counter argument” guy, he is the one with those “devine intervention” blog post links, right? which is why people reading your dumb comments wonder if you don’t care. Calling any scientist who post science research with data, should never be disrespected. Name calling will not address what they publish because it a personal attack. Attack what any scientists publish, not them personally,then you will have a real debate. That is what I see about you is your ugly style of bad arguments with people you don’t agree with. I am one who wants YOU to stop with the name calling,the disrespect and dishonest comments you have posted,this is why I keep trying to get you to provide an honest effort to debate,leaving out the angst,and whiny complaints that hardly anyone agree with you. How can it be called trolling when many here ask you questions you often avoid answering,ask you to stop stating to or explain the word “denialist” name calling,the continued disrespect of various scientists who have been discussed? You hardly ever debate,since you are so quick to name call,keep deviating or dodging questions and move the goalpost. It is dumb to avoid answering relevant questions,dodge data based counterpoints and call many people denialists,then complain when you get replies you don’t like. You are not very good at debating, as you overreact,regularly insult scientists with name calling and look down on people here with your snotty attitude. Has this now been sufficiently settled so that you can call those who question your position that humans control ocean temperatures by emitting more or less CO2 denialists and non-scientists? Again, not calling everyone who disagrees a denialist, I am calling denialists denialists. Disagreeing is not a sign of being a denialist. I don’t know how often I have to repeat that for you. Is that so? Can I cite you on that when one of you skeptics does it again? That bitter&twisted thread has a starting comment, I replied in plural form. And you seriously don’t recognize the massive amount of trolling that is going on here in the comment section of this post alone? Someone not sharing you weird opinions is posting a comment and multiple replies from the NTZ crowd appear trying to get an angry response from that person. Since I became a somewhat “regular” commenter, “the crowd” does that preemptively in my case. The DENIAL by alarmists (ironic !) of the fact that the MWP was a global event and as warm, likely warmer than now speaks to their credibility. Peer-reviewed studies and data overwhelm that denial. There are 6,000 boreholes around the globe which conclusively demonstrates that the MWP trend was global. The peer-reviewed Greenland temperature study (gisp2) shows, among other things, that Greenland was warmer than now. The receding Mendenhall glacier recently exposed a shattered 1,000 year-old forest still in it’s original position. No trees have grown at that latitude near that site since then. There are hundreds of peer- reviewed MWP studies, some even before climate causes became controversial. Almost every such study has been cataloged at co2science.org. A subset of those studies directly address temperature. Choose several regions distant from each other and also distant from Europe, Greenland, and Alaska. Select a temperature based study from each. you will find that site was likely warmer than it now is. Why do alarmists insist this is not the case? Probably because their computer models cannot explain it, perhaps because co2 increase drives their models. Co2 had not increased during that period and had been the same before then for hundreds of thousands of years. There is interesting information about the climate in the North Atlantic and arctic Ocean 1000 years ago on a Vinland site funded, by, amongst others, the Canadian Govt . This site is the creation of a team of funding partners, researchers, computer and educational specialists, translators, revisers and administrators. It contains information drawn from archaeological sites, historical and archaeological artifacts and records preserved in museums, libraries, archives, and private and government collections. (Robert McGhee, then Head of Scientific Section, Archaeological Survey of Canada, Canadian Museum of Civilization, Ottawa). “By about 7000 years ago the massive glaciers of the last Ice Age had retreated to the mountain peaks of the eastern Canadian Arctic. Tundra vegetation had become established, and was grazed by caribou, muskoxen, and, in some areas, by bison. The gulfs and channels between the arctic islands had long been at least seasonally ice-free, and provided a home to populations of seals, walrus, and whales. There is considerable evidence that for the next 3500 years the arctic climate was noticeably warmer than today, the tree-line was north of its present position, sea ice was less extensive, and animal populations were large and well established. We are all living longer due to a better environment ,better food, better shelter, better weather, better jobs, better technology, better medicines, better water and above all a better education… except SebH who seems to have missed out on attending school. One has to wonder what exactly Sebastian’s qualifications are. P.S. : A lightbulb can also become very bright for a short time and melt afterwards, or it can light the room for a much longer time at a more sustainable setting. The problem is that our way of life is not sustainable, not if the rest of humanity catches up to western standards. Attacking the messenger is standard Alarmist practice, Sebastian. How do YOU know seb? Do you have a computer model to ‘prove’ this is true? If not then you have nothing, just an anecdote of events you may, or may not, have witnessed. No seb, the boot is on the other foot. YOU are the one that completely UNSKEPTICALLY take the IPCC’s political reports as science, YOU that takes unreal model outputs as a good representation of how climate functions. YOU are the one in error. You who eats the ‘consensus’ pie without seeing it is full of political excrement. And I will add this… the very role of a Scientist is to be skeptical. Indeed, but being skeptical is different from being in denial and misleading people on purpose. That’s what those “respected scientists” are doing that get a mention on this blog every few days. And I’m skeptical that YOU understand this! Thus far, by the evidence of your remarks, you do not. Sebastian is no doubt well paid to write his nonsense. No sane person would do it for nothing. Are you doing it for nothing? What question? What drugs are you on and why do you reply to a comment without answering the question yourself? Do you see the problem with these kinds of replies of you and others on this blog? You only offer the same old BS. No thought, nothing new but the same UNSKEPTICAL nonsense. As far as I can see YOU have the problem with this blog, you appear to unable to allow such heresy against you AGW religious conviction go unanswered. And I find your insinuation that I am ‘on drugs’ very offensive, and would like an apology. Not that I can believe your ego can allow you to offer one. I apologize for insinuating that you are on drugs. I find everything you write very offensive and would like an apology. Will your ego allow you to offer one? P.S. : “the same old BS” is what you get when you disencourage people to do the hard work of gathering sources, arguments, etc by ignoring them. I guess you (not you specifically, but all the “skeptic” commenters here) are really grinding down opponents by the level of ignorance that is being displayed here. And when you brought them to your level (comments with zero content, just defending or debating about the use of words) you win because you have more experience on that level. Almost a year ago I found this blog and thought it is interesting that people exist, that have these strange views on the world. I tried to find good arguments and got trolled by AndyG55 and others like him for it with nothing but unscientific nonsense. Additionally Kenneth just bombs you with cherry picked quote. Which I thought is good at first, but when I found out that he misinterprets almost all papers he quotes from, well … at some point you have to give up and I guess I have given up on you guys. Just here for the entertainment anymore. It’s not interesting to debate with Kenneth or you about whether or not I said those scientists weren’t scientists or not. Oh my. It’s the almost-all-scientific-papers-are-misinterpreted-by-directly-quoting-authors’-exact-words accusation. SebastianH has been bombed (!). At least this one is better than your usual name-calling, or calling people “stupid”. Only person with ZERO science is YOU , seb. If the number of skeptics is around ’12 %’….. what does that make the ’97 %’ consensus? Seb, you are good at math, what do you get? Any good at reading? “12% of all (climate) skeptical scientists have something to do with environmental sciences and only 0.1% are climate scientists” is the original statement. Don’t mix up percentages that can’t be mixed. The word denialist is a propaganda tool meant to close down debate, while also giving the moron who uses the term a false sense of intellectual and moral superiority – perfect for people that can’t think on their own, and need big daddy gov’ment to tell them what to do, and how to think. Characterized by black and white thinking which is all to evident with Sebastian H – he has no facts, does not post any, simply uses the worst fallacy in science debates, and appeal to some kind of authority, when science by definition should have no central authority. It was bagged by the Warmists. There was over 3000 references in it. He was a Geologist at Adelaide University and the Greenies complained that it was biased because he worked for BHP. Why wouldn’t he ? He’s a geologist! I think your average bod just reads the paper. For e.g the SMH in Oz. Every single article he has written is biased toward Warmist thinking. He is a qualified Social Worker !!!! Sebastian says he comes here to waste time. We should believe him because he is never wrong. This is a good text but there is a little mistake in it: SRF is the public TV- and Radio-corporation of the German-speaking part of Switzerland, not of South Germany. Sometimes you just can’t convince people about the error of their ways. Seb H your thinking is completely erroneous. If you would be so kind and reply to where I made a mistake instead of putting your comment at the end of the list? I am eager to read your explanation. Do you think you could be convinced? Or is it more like this with you? Excellent link this explains everything. The reason why you must come here and attempt to ‘correct’ the views expressed here. Your core beliefs, beliefs that appear to be held to the point of a religious conviction, are being attacked and YOU are retaliating, as poorly as only you can, with ‘blow-back’. Your core beliefs that were developed from childhood, and are compounded by life’s experiences to obey the authority of those you perceived as your betters and never be skeptical of them, never to question what they say. This has ensured you are irrational, inflexible, illogical, rigid, and incredibly sensitive to being challenged on your core belief of the religion of AGW. Sorry mate if I appear to show no sympathy, or even be callous about your core beliefs, because to be honest I don’t care about you or your core beliefs, as it’s obvious, you’re a bit of a snow-flake. It’s about time you grew up, and realized the world does not revolve around you and your core beliefs, no matter how much you think they should. SebH Do you have a Science Degree ? Would you care to answer my questions first and learn how to comment on blogs/threads? It appears to me that you are not answering questions, but making statements and unfunded ones as well. So i take it that SebH does not have a Science Degree. Been pretty obvious from the start that seb’s abilities at maths and science are RUDIMENTARY at best.